Ames Main Street is preparing a new event the First Friday of every month, patterned after the Art Walk and First Fridays in other cities and is meant to support, nurture and celebrate all the ideas that we think make our city super rad. Inkblot Studio's First Friday offering will be a walk-in Flash event. This will be the second walk-in event we've had and one that we hope to build upon, and that will add to the array of First Friday events we are hoping will come to fruition. This is a small sample of the flash designs Kristyn will be offering during this event. Each of these will be done a maximum of one time. 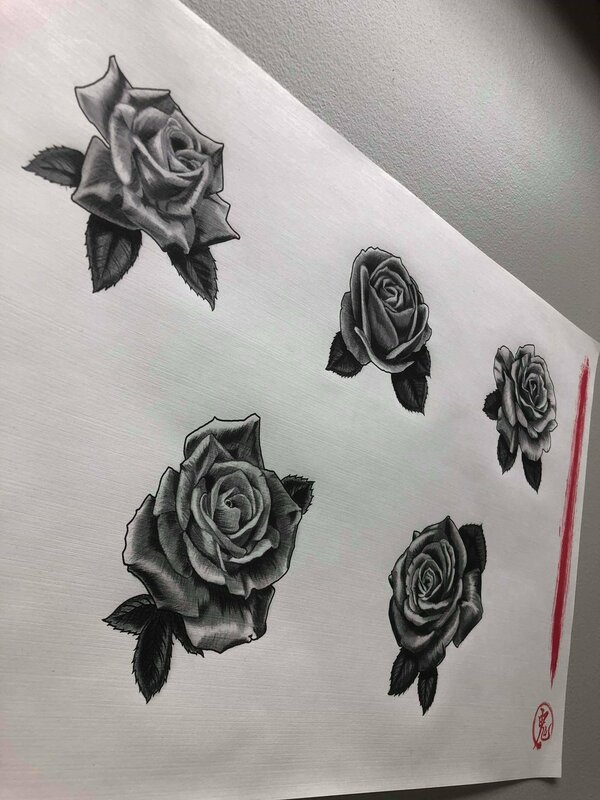 Reed will be doing these flash rose designs he made for $50 each. There will be no limit on how many times these will be done. Been wanting a cool tattoo but pocketbook not cooperating? Interested in helping our apprentice progress faster? Just wanting to check out the studio? Sunday, April 8th will mark our second ever special tattoo event. Reed Wu, our apprentice for over a year, is finally getting ready for the next phase of his apprenticeship and will be giving away tattoos based on his hand-painted Chinese calligraphy. Worried about translation? Reed speaks Mandarin as well as English and will be offering a set of images based on classic Chinese idioms and sayings. We will not be taking appointments for this event and it will be first come, first serve. These pieces will be 100% free although we are intending Reed to be tipped handsomely for the time he is putting into this day. I could not be prouder to introduce my apprentice, Reed Wu, of Ames. Reed has been our apprentice since August of 2016 and is beginning to tattoo this Spring. Reed has a BFA in Integrated Studio Art from ISU and is currently driving the Gold route for Cy-ride while completing his apprenticeship and keeping our floors mopped at the studio. We will be announcing special opportunities to receive free or heavily discounted work from Reed to give him opportunities to master his craft. He is also able to be commissioned now for work to be done as he becomes fluent in the medium. Once again, watch our calendar and like us on Facebook for updates and email Reed at reedwuart@gmail.com to inquire about availability. I am happy to announce that we have hired a new artist, Kristyn Kay Borglum of Cedar Falls, IA. Kristyn will be moving to Ames in August so that her partner, James, can attend ISU for Software Engineering. Kristyn has a BA in Studio Art from UNI and is currently working at Twisted Fate Tattoo in Cedar Falls. She will be working at Inkblot roughly one weekend every month as a guest artist and starting full time in August. Watch our calendar and like us on Facebook for updates and email Kristyn at kristyn.borglum@gmail.com to inquire about availability. Departures: Farewell Amy Jiao and Darian Williams! So many announcements at Inkblot Studio and I'm trying to catch up with some of my social media updates. Last summer Darian moved to Pink Elephant in Ankeny, IA. We miss him but it looks like he's been settling in quite nicely. Please direct any inquiries for work to dariantattoos@gmail.com. Amy's husband has accepted a job teaching at Cornell University and Amy will be tattooing at Ascend Galleries in Cortland NY. She will be returning periodically for guest spots so pay attention to our calendar! Email Amy at amy.jiao@gmail.com.